"Boasts a push-button start, six deck height options, and grass collection bag." "Lightweight and it provides a consistent cut." "Can run for up to 35 minutes per charge...and surprisingly powerful." "Impressive 45 minute run time and can mulch, bag, or side discharge clippings." "Powered by three brushless motors that can cover up to 2.5 acres of land." "Has unlimited run time and requires no charging." "Has a small 19-inch deck and can run for 45 minutes per charge." "Has a sizable 21-inch deck that will help you make quick work of your yard." While on the more expensive side, the EGO 21 in. 56-Volt Lithium-ion Cordless Walk Behind Self Propelled Mower Kit outperforms its competition in the electric lawn mower space, making it one of the best products you can buy today. This battery-powered lawn mower has a 21-inch deck, and its battery delivers the same high torque you’d expect from a gas-powered mower. You can get up to an hour of cut time per charge, and the self-propelled EGO lawn mower comes with a rapid charger that will juice up the battery in 60 minutes. In addition to its 3-in-1 mulching, bagging or side discharge capabilities, this mower boasts a push-button start, six deck height options, a two-bushel grass collection bag, and LED headlights. The EGO electric lawn mower has more than 3,000 5-star reviews from users who say it’s amazingly easy to use and store. Many say its runtime is much longer than other battery-powered products, and it can cut through thick grass better than expected. Lawn mowers can cost hundreds of dollars, but you don't have to spend an arm and a leg to get a quality electric lawn mower. The Sun Joe MJ401E Mow Joe 14-Inch 12 Amp Electric Lawn Mower is a great budget option for those looking to keep a small yard neat. This lawn mower does have a cord, and its maximum extension length is 100 feet, making it ideal for use on a ¼ acre or less. It has a small 14-inch deck and includes an easy push-button start, as well as three different deck height options. Although it's a budget option, this Sun Joe lawn mower still has a grass bag, allowing you to catch clippings and discard them easily. Reviewers say this is an awesome electric lawn mower for the price. Several write that it’s lightweight and easy to steer, and it provides a consistent cut, even in thick grass or weeds. However, one downside several users note is that you may need an extension cord if your yard is on the bigger side. Self-propelled lawn mowers use power from their engines to turn the wheels, making them infinitely easier to move around your lawn. If you're looking for a great self-propelled electric lawn mower, the Ryobi 20 in. 40-Volt Brushless Lithium-Ion Cordless Self-Propelled Walk Behind Mower definitely fits the bill. The Ryobi Self-Propelled mower has a 20-inch deck, seven height options, and can run for up to 35 minutes per charge—this time may be shorter than that of push mowers, as energy is being allocated toward propelling the machine. It takes 3.5 hours to charge the battery, and you can choose to either mulch or bag your grass clippings. Reviewers write that this power is easy to set up, quiet during operation, and surprisingly powerful. Many love the various self-propulsion speeds, noting that this mower makes is a breeze to mow on hills or long stretches. If you have a relatively flat lawn, you may be fine with a standard push mower, which doesn’t propel itself forward. The EGO 21 in. 56-Volt Lithium-ion Cordless Battery Walk Behind Push Mower is a great option in this case, thanks to its impressive 45 minute run time, which allows you to mow up to two miles per charge. This push mower has a 21-inch deck, six height options, and can mulch, bag, or side discharge clippings. The included charger will juice up the battery in just 40 minutes, and the included grass collection bag has a two-bushel capacity. 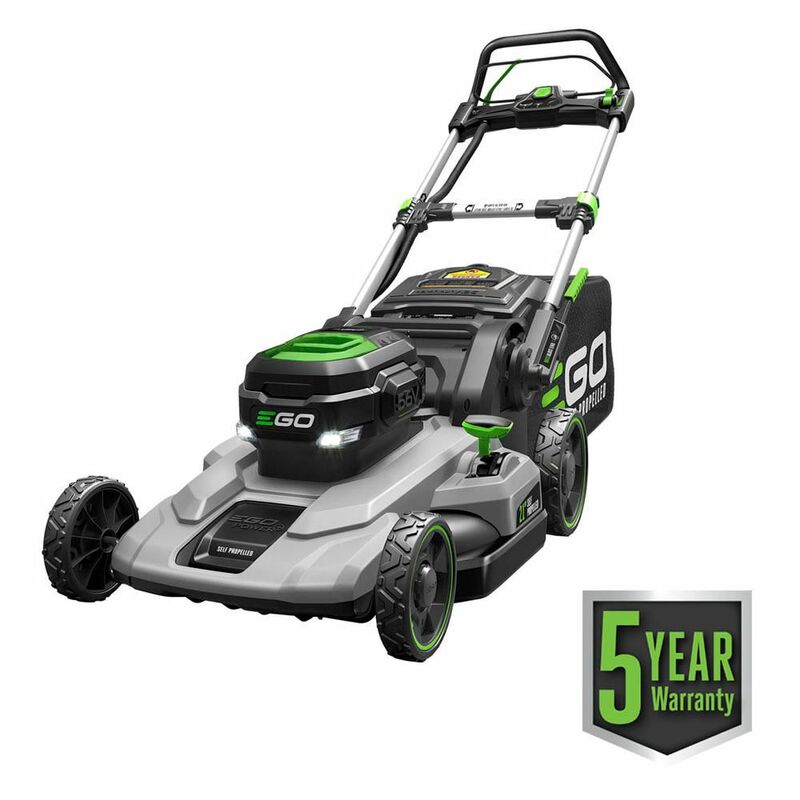 Reviewers love that this mower is incredibly quiet, yet packs the same power as a gas mower. Believe it or not, you can actually get a battery-powered riding lawn mower. While models like the Ryobi 38 in. 100 Ah Battery Electric Rear Engine Riding Lawn Mower isn’t cheap, they provide an impressive run time and superior performance, all while still being quiet and eco-friendly. This ride-on electric lawn mower is powered by three brushless motors and has a 2.5 hour runtime that can cover up to 2.5 acres of land. It has a 38-inch deck and 12 deck heights, as well as a built-in phone charger! However, note that you must charge this mower for 12 hours, so it’s best to do it overnight. Reviewers say this mower will “run forever” and is easy to handle. The only complaint people note is that the seat isn’t the most comfortable, especially if you’ll be sitting on it for a few hours. There are several benefits to corded electric lawn mowers, including unlimited run time and no charging. However, the major downside is that you're restricted by the cord length and must have an electrical outlet available nearby. If you have a small yard and think a corded mower would be fine for your needs, you should look into the affordable Greenworks 20-Inch 12 Amp Corded Lawn Mower. This machine has a 20-inch steel deck, seven-position height adjustment, push start button, and more. You can choose between bagging, mulching, or side discharge, and reviewers say the mower is whisper quiet and perfect for small lawns. Some recommend investing in a brightly colored extension cord if you want to mow larger areas, writing that a bold color will ensure you don’t accidentally mow over your power supply. If you have a small yard—typically 1/4 of an acre or less—you don't need a huge, powerful lawn mower to get the job done. Instead, an option like the Snapper XD 19 in. 82-Volt Lithium-Ion Electric Cordless Walk Behind Push Mower will suit your needs just fine. This machine has a small 19-inch deck and can run for 45 minutes per charge. Plus, it takes just 30 minutes to charge the battery back up. It can either mulch, bag, or side discharge clippings, and there are seven different height positions to choose from. While it is a push mower, reviewers say it's easy to move thanks to its lightweight design, and many note that it cuts just as well as a gas mower but is extremely quiet. It can be challenging to find an electric lawn mower that can manage a larger yard on one charge, as most machines have a runtime of less than an hour. If you want the low maintenance, eco-friendly benefits of a battery powered machine, but still need to cut an acre or more, your best option may be the Redback 21 in. 120-Volt Lithium-Ion Battery Walk Behind Push Mower. This push mower has a sizable 21-inch deck that will help you make quick work of your yard, and it has an impressive one-hour runtime that will ensure you can get even biggest jobs done. The battery charges up in just an hour, and you can choose between mulching, bagging, or discharging grass clippings. Reviewers write the Redback lawn mower packs a powerful punch—one person says it even tackled grass that was close to two feet tall after several weeks of not mowing. The only downside of this electric lawn mower is that it is a push model, which will likely tire you out if you're mowing an acre or more. Our writers spent 2 hours researching the most popular electric lawn mowers on the market. 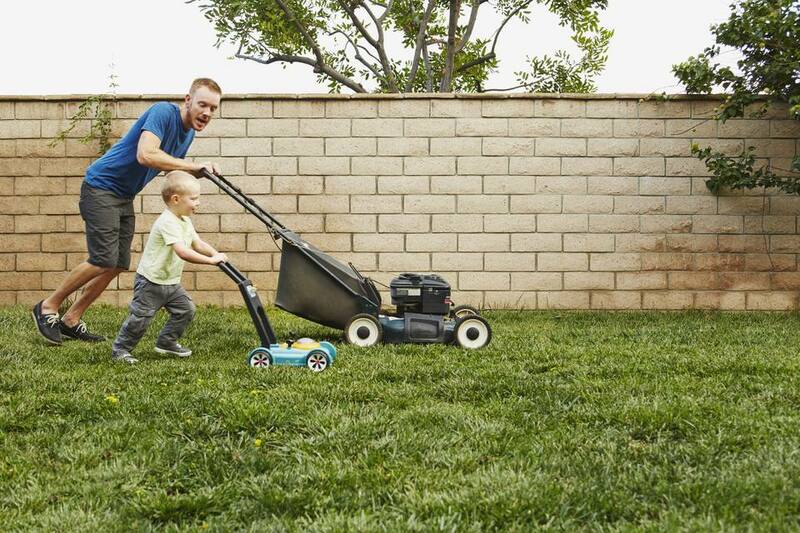 Before making their final recommendations, they considered 18 different lawn mowers overall, screened options from 10 different brands and manufacturers and read over 35 user reviews (both positive and negative). All of this research adds up to recommendations you can trust.